This is what I have been telling church leaders for years. It’s not as hard as you think. I developed a marketing blueprint that is predictable and easy to use. If you follow the blueprint, you are going to get incredible results. I have heard church leaders from all over the country say they were skeptical, but they followed the plan and it worked. 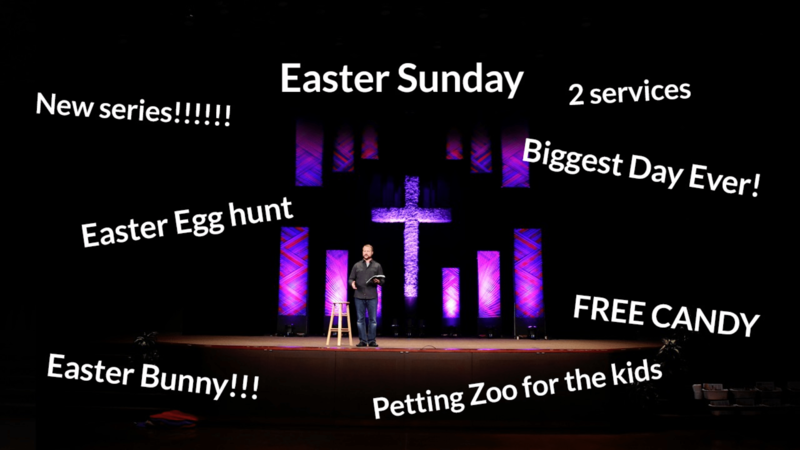 Before we get into the marketing blueprint, let me tell you four reasons why you should push for big attendance this Easter. faith, and invite their friends, neighbors and family. While all of those things are true, I just vomited out every bit of information. Every bit of leverage I had on their curiosity is now gone. My enthusiasm got the best of me. Because I announced everything already, I had to keep repeating myself for the next five weeks. There was nothing new left to promote! By the time Easter arrived, I hadn’t built any curiosity. Effective promotion causes people to become curious. Hollywood does this better than anyone. They know how to make audiences yearn for more so that when a movie finally does hit theaters, people are clamoring to see it. The live action version of Beauty and the Beast is about to be released. The marketing for the film started a long time ago with much care and precision. The trailer doesn’t give anything away. Audiences are left wanting to see more. This trailer came out nine months before the movie was to be released. Can you imagine if Disney had released this trailer nine months ahead of time? What else is there to show? What else is left to explore or be curious about? When you promote Easter, it’s important to layer your marketing like Beauty and the Beast. Your audience is curious, and can’t wait until you share more. This is the “why” behind marketing. Now let’s talk about “how” you should promote Easter. Below is my Easter Promotion Blueprint. If you follow the plan, the results are predictable. You are going to have more people show up than ever before because you have properly promoted a big event. Very similar to your stage announcement. You mention something very exciting you can’t wait to share in the future. It can be on your church newsletter, or it can be from the pastor. Send an email about something very exciting that you can’t wait to share in the future. I think it’d be probably best coming from the pastor. Announce your official Easter services with a logo and service date, but promise more details next week. The only thing that you’re revealing is the logo and the service date. You don’t have to do times, because at that point, they don’t need to know times four weeks out. This can be very similar to your stage announcement. You can use an iPhone video to announce it on Facebook Live and/or Instagram. Keep it short, sweet, reveal the logo. This could be from the church. Show the official Easter logo, service date. Promise more details next week. See what we’re doing? We’re only revealing a layer of the onion one week at a time. Three weeks out, you need to do two stage announcements. This must be from two different people. Then, this is where you’ll introduce your first promo video. The first promo video … If you’re going to have a music bed on it, I would use something that’s a little bit more medium paced. Not slow, but medium. Then, in your stage announcement or in your video, add one more bit of info that’s not been shared yet; Like you’re going to have a petting zoo or you’re going to have 5,000 eggs, or a helicopter egg drop. Whatever the case may be, you share just one thing. Don’t share everything, just one thing from the stage. First, you’re going to post the promo video and tag your most influential members. Then, privately, ask them to share it, post it and comment, so it gets more views. Email the church with a link to the video so they can watch, share, comment, etc. Here’s where you transition your message from information to action. TIP: Provide your people with promo materials. Give them the ammo they need to share it, post it, re-share it, comment about it. Give them images, give them links, give them videos. You can even create a page on your website that has all this. Then, you can also do a pre-written post. People love what’s done for them. Write out a tweet. Give them three options, give them three Facebook posts, give them an email to share. It doesn’t have to be super fancy, just give them three different options. I want you to use two different people. It doesn’t have to be the pastor, but it needs to be two different people. Then, I want you to specifically ask the congregation … This probably could come from the more influential of the two people … Ask the congregation to post, share and tag their friends. Play updated promo video, use medium tempo music, medium to fast tempo music at that. It could be the same video, just update the music. Post the updated video and graphics for people to share. Ask people to share/retweet/repost. Email your church asking them to specifically share and tag their friends on the various social media platforms. Then, ask them to personally invite their neighbors and people in their community to the services as well. This is fast and the furious. This is like the final trailer of Beauty and the Beast. Make sure you use multiple people, so it’s just not the pastor. You want this to appear like everybody is on board, and everyone’s excited about it. Make it a very diverse group. It looks like this is really connecting and appealing to everybody. The last thing they hear from the stage needs to be: “Next week, don’t forget. Join us for an incredible Easter Sunday.” This can be really quick. I know. Three emails sounds like a lot. Here is an interesting fact for you, on a really good day, only 30% of the people you send an email to will actually open it. Some may get it in their junk folder, some just don’t have time and some may not be interested. Nevertheless, only a fraction of the people you email will actually see or open it. The point of multiple emails is to increase awareness and make sure everyone has a chance to at least see/open one email from you. Send an email six days before Easter. Send an email three days out. Send an email the day before. Every day, post the video, post countdown images, post graphics for people to share. Ask questions: What is your favorite Easter memory as a kid? Do you like the … It could be simple questions. Increase engagement, if you will. Don’t ask how or why, like, “Why is Easter important to you?” People are less inclined to comment or respond to why or how questions, because they take a lot more thought. If you say, “What was your favorite Easter memory? Where does your family go?” What, where and who; Those are great questions to start with on social media. If you execute this plan, you are going to have more people show up for Easter than ever before. This is incredible news because more people get to hear the Gospel preached and have an opportunity to respond.